Tango spanned the twentieth century. It was the fabulous dance of the past hundred years  and the most beautiful, in the opinion of Martha Graham. Late 19th century Buenos Aires teemed with immigrants from Europe and Africa, many of whom found themselves lonely and looking for companionship in their new home. These forlorn people found their way to the salons, seeking drinks to drown their sorrows, temporary friendship, and any entertainment to help ease their depression. The mix of cultures combined to bring about a new style of music, formed from African beats, Indian rhythms, Latin influences, and the popular music of the pampas (flatlands) in Argentina. This new music was dubbed Tango. The dance that began as a pantomime of communication between prostitute and pimp was filled with emotions, sexual energy and suggestive gyrations. This choreography was accented by the melancholy drone of the bandoneon, a German instrument very similar to the accordion. In the early 1900s, a less vulgar form of tango was exported to France, where it was further refined and quickly gained popularity with the Parisian high society. Adding classy clothes, ballrooms, lyrics, and an orchestra, the Tango was revolutionized for the rich and became popular all over Europe, the USA, and was even embraced by the upper class of Argentina---the same people who once shunned its odious beginnings. 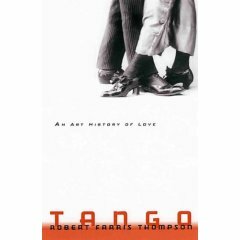 From it syncretic evolution in the nineteenth century  partaking of European, Andalusian-Gauch, and unbeknownst to many, African influences  to its representations by Hollywood and dramatizations in dance halls throughout the world, Thompson shows us tango not only as brilliant choreography but also as text, music, art and philosophy of life.